USD #444 Powers Up with McREL Power Walkthrough! USD #444 in Little River, KS, has opted to use McREL Power Walkthrough (PWT) as their go-to tool for classroom observations. The research-based classroom observation software is designed to quickly and effectively gather classroom data and provide instant and formative feedback to teachers to inform practice and bolster their strengths in the classroom. Administrators at the Kansas school needed a simpler and more efficient way to perform classroom walkthroughs, and they believe they’ve found what they need in McREL PWT. Ready to find what you need for more efficient walkthroughs? 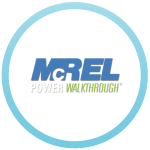 Click below to learn about McREL Power Walkthrough! St. Peter Catholic School Plans for Success with eWalk!